The Energizer 357 battery and A76 battery are tiny batteries with many uses. These 1.5 volt size 357 batteries are used in watches, medical equipment, laser pointers and more. Size 357 batteries are silver oxide batteries, while A76 batteries are alkaline batteries. Certain precision electronic devices should use 357 batteries instead of A76 batteries. Check with your manufacturer if uncertain on which battery to choose. 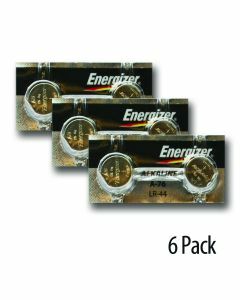 Medic Batteries carries high quality Energizer 357 batteries and A76 batteries. The Energizer 357 battery and A76 battery is 100% guaranteed. These 357 batteries ship free, same day if ordered by 4 p.m. EST Monday - Friday. Why buy Energizer 357 battery anywhere else? Trust Medic Batteries!